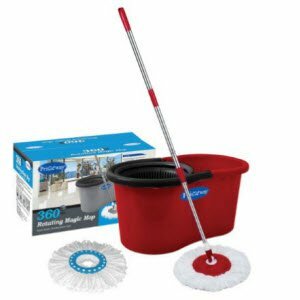 Amazon is selling Primeway 360 Rotating Magic Mop and Bucket + 2 Microfiber Mop Heads Rs. 849 only. Keeps your hands out of dirty water, Time saving, energy saving, eco-friendly. Super water absorption microfiber mop refill. Durable and longer service life. On-off button, make handle longer and shorter, Easy to assemble and replace the mop disk without tools.